This paella is so good. Ian believes it is better than the ones we had in Barcelona. In fact it is . Probably because we haven’t found the restaurant in Barcelona. 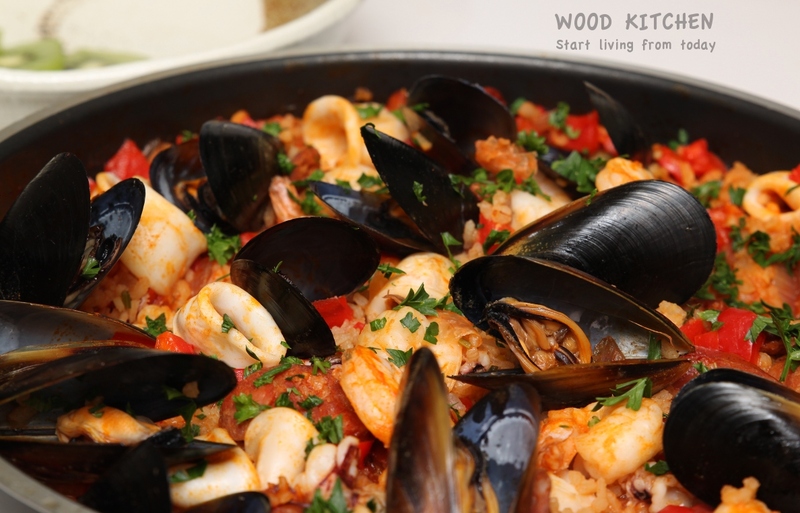 Also, because I am following this recipe http://www.kitchenproject.com/history/Paella/Recipes/Seafood-Paella/index.htm. With small modifications. Short grain rice (2 cups), Chorizo (2, about 200 g, sliced), prawns cutlets (a dozen), baby squid (half dozen, sliced into rings), mussels (a dozen), Spanish onion (1), red capsicum (1, chopped), garlic (4 cloves, minced), canned whole tomato (1 can), smoky paprika (2 tablespoon), saffron (2 pinches), fresh parsley (1/4 cup, chopped), chicken stock (4 cups), olive oil (1/4 cup). Marinate the Saffron 1 / 2 cup of the stock. In a large frying pan, heat olive oil over medium heat. Brown the slices of Chorizo, and then add Spanish onion, red capsicum and garlic. Saute until the veggies starts to caramelise. Add rice and smoky paprika, and fry for a minute. Add canned tomato and cook for 1-2 minute. Add chicken stock and saffron with the water, bring to simmer. Reduce heat, cook until rice is almost tender. 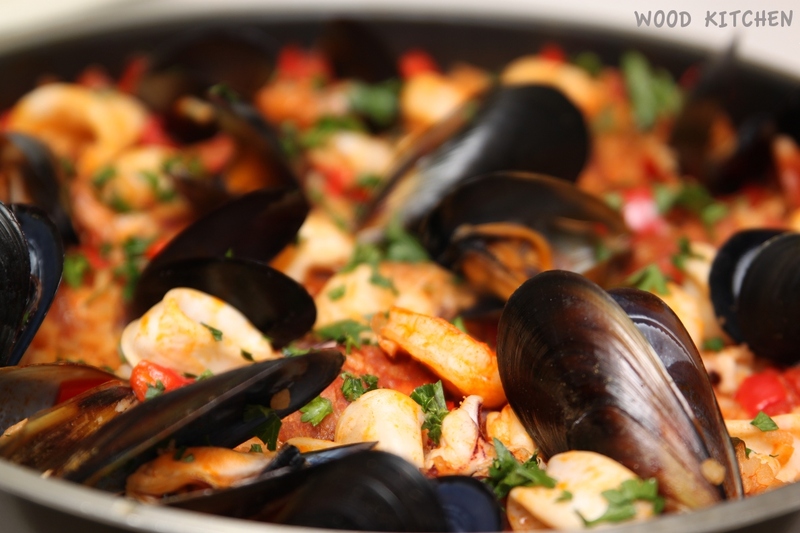 Turn the heat back up, add seafood, cover with a lid and cook until mussels are opened. Discard the unopened mussels. They are lovely! Hope you will like it! This is a great and straightforward recipe for a classic paella – some recipes I have tried are just too cumbersome. While I have had not great paella in restaurants in Spain, home-made ones have never failed to please. Thanks for sharing this one. What a wonderful party dish to bring, everybody should love mussels as much as my husband and son do. I think the best part is the broth at the bottom of the bowl, best sopped up with some bread. Thank you for bringing to the party and by the way the photographs are gorgeous! Thank you! Happy FF part 2! Looks great! Perfect way to get rid of the winter blues too! I love mussels and paella but have never made it myself. Beautiful dish I will be pinning! Paella is the perfect party food! I love your choice of ingredients…classic and delicious. A big paella pot is on my list of cooking tools I’d love to acquire…thanks for providing a recipe to use when I do! I know this fabulous dish will be greedily accepted by everyone celebrating the Fiesta Friday Anniversary Party! Love paella and yours is inspiring me to get my paella pan out and make this too! I haven’t yet made paella at home, though I have been planning to for a long time. Your version looks just brilliant! Thanks for sharing. In Spain in every home have a ” perfect recipe ” of paella , and are a little different this that enseñas.Pero us in the pictures look delicious.